ChurchMag / CMS / ChMS / Is SoChurch a Church CMS? 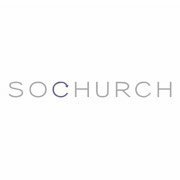 Is SoChurch a Church CMS? On a previous post, Chris was wondering how SoChurch fits into the Church CMS picture. To answer that, the companies that we feature here are focused on Church administration, including tracking attendance and financial data, keeping tabs on member information and creating reports. But SoChurch addresses a different need: communication. The core of SoChurch is a focus on community and communication. In practice, that means you put your members in groups (sunday school classes, life groups, etc.) and communicate with content that is targeted specifically for them. This way you won’t be emailing your whole list each time choir practice is canceled. SoChurch can serve as a replacement for your current site, or be used as a community site on a subdomain (community.examplechurch.com), complete with your church’s custom branding. It’s easy to update, and can pull from the communications back-end, Facebook and Twitter. 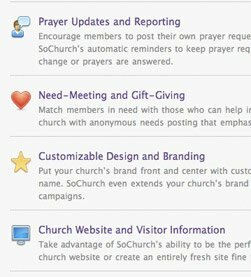 SoChurch plays nice with the social media tools your church already uses, like Facebook, Twitter and Google Maps as opposed to trying to replace those services. For example, SoChurch uses Facebook Connect to pull in a users profile information (with their permission) to make it simple to set up an account. Also, what about the people who aren’t interested in using Facebook? Well, SoChurch will allow them to interact with the church’s content without being a member of Facebook at all. Side note: There is a hidden benefit to allowing nonmembers to interact off of Facebook. Social networks tend to rise and fall (Myspace), and even though it looks like Facebook will be here for a while, making Facebook your “home base” for long term social media engagement is probably not wise. The point here is that SoChurch will not replace your social networks but play nicely with them and beside them. Instead of becoming “another” destination site in an effort to create a “online ghetto” it seeks to release the data flow between them giving your members unparalleled access to the information that they need, where they need it. As Tony Hsieh (CEO of Zappos) writes in his book Delivering Happiness, “communication is always one of the weakest points in a company [or church] no matter how strong the communication is.” SoChurch is designed to make external communication way more effective but shouldn’t be considered a complete replacement for the heavier ChCMS’s that focus on internal data management. Pricing ranges from $7-$99/month, and right now they’ll give you 50% off your first year when you preregister. I worked with the 8BIT team for a year, then started GarnetReport.com. Right now we're building GarnetReport into a sweet News site for students. I love British authors and storytelling.